As part of the Mullet Creek Restoration Project being carried out by Pittwater Environment Foundation, a survey of amphibians and reptiles is currently being undertaken by Northern Beaches environmental consultants at Coastwide Marine (Environmental Management and Ecological Services). Project manager Tracy Chambers has engaged Herpetologist Chris Jolly to assist in the surveys. Of particular concern in the Mullet Creek project is the protection of habitat for the endangered Giant Burrowing Frog and the Red Crowned Toadlet. Exciting news so far is a rare sighting of the Giant Burrowing Frog during nocturnal surveys in the escarpment of the northern arm of Mullet Creek. According to "Atlas of Living Australia" this is only the 3rd record of the species in this bushland patch in 20 years. The last two occurred on April 1993 and July 1994. The Giant Burrowing Frog (Heleioporus australiacus) is listed as Vulnerable under the NSW Threatened Species Conservation Act 1995 and federally under the Environmental Protection and Biodiversity Conservation Act 1999. It is one of our largest frogs and a burrower. The Great Burrowing Frog usually spawns in a small water-filled burrow or under thick vegetation in dams, ditches, and slow flowing streams. The tadpoles hatch and escape when the water rises to flood the burrow. Threats to the habitat of the Giant Burrowing Frog in this area include habitat loss through clearing for residential, agricultural and urban development, and reduction of water quality generally in the vicinity of urban development. This project will go along way to ensure rare and endangered species like the Giant Burrowing Frog have a healthy home and remain a Northern Beaches treasure for the future. Pittwater Council reports the Giant Burrowing Frog was photographed sitting in undergrowth near the creek in Ingleside Chase Reserve. 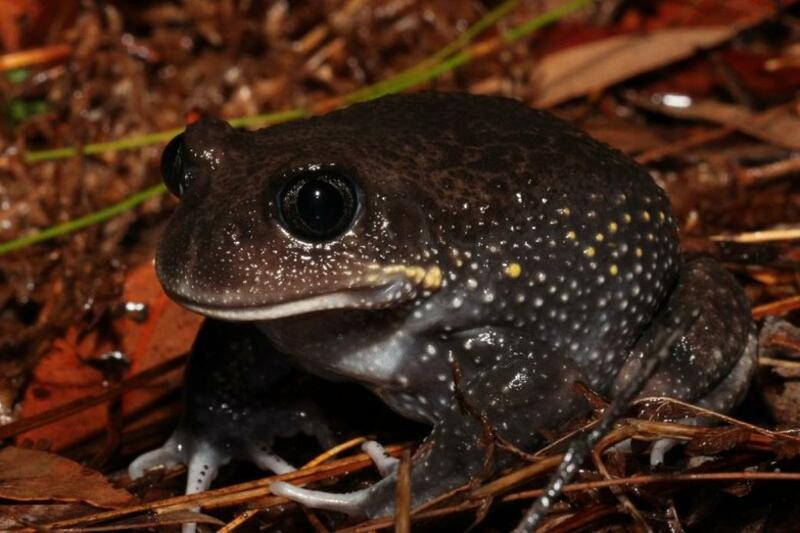 Only eight previous sightings of the frog in Pittwater have been recorded, with the last one in the late 1990s according to Dr Arthur White, a local frog specialist. The Giant Burrowing Frog is a large slow-moving frog growing up to 10 centimetres in length. Its slowness makes it very vulnerable to predators. It gets its name from its oversized feet and muscular back legs which it uses to dig down into the earth and build burrows for breeding. Mr Beharrell said the survey of amphibious life in the Ingleside Chase Reserve and Mullet Creek areas had revealed relatively low numbers of frogs, making the find even more significant. “Frogs and tadpoles are an important indicator of the natural environment’s health and diversity,” he said. Mr Beharrell said another survey would be conducted in two years to establish any change in population numbers.